Home Unlabelled I love Juicy Skin! Tell you all something super stupid ok? The reason why the above pic is so teal themed is because I thought I wanted to start this advert by saying "I feel like a mermaid because I'm so hydrated" then I realised it is very lame LOLOL. So that's just a picture where I happen to be wearing blue-green stuff. 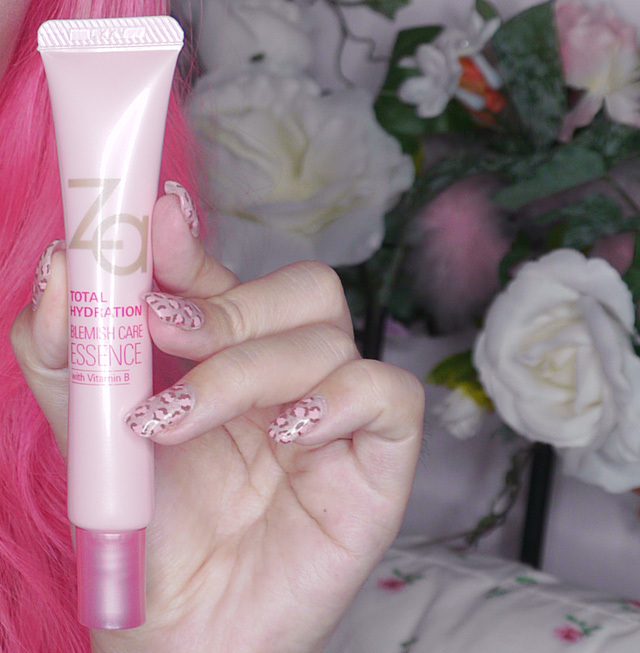 Today I'd be reviewing a new line of skincare from Za!! The products are the most gorgeous shade of pearly milky pink! :D Would look so good on any vanity. Say hello to Za's new skincare range - Za Total Hydration! This range is specially formulated for ladies in their 20s (which, ahem, includes me even though I'm almost out of there). Actually I remember when I was a teenager and I started to get zits, my mom told me to start using facial cleansers, and she also bought me a milk moisturizer. When I was younger I never ever felt the need to moisturize, mostly coz I didn't sleep with the aircon on. My face was just super oily all the time - I could soak up 1 and a half of those rubbery facial blotters! As such, when I put on oil based moisturizers, the oiliness actually became worse and made me grow more zits. I swore never to use moisturizers again. Of course as I grew older my skin got drier and drier and I had to eat my words. In fact, nowadays if i don't moisturize straightaway after a shower, my skin actually HURTS. I'm not sure if this is a common thing but thanks a lot skin, way to remind me that I'm old!! You may think being youthful mean you can't have dry skin.... Don't be mistaken like I was, just because your skin is oily doesn't mean it isn't dry! In fact, the solution to excession sebum and enlarged pores is to MOISTURIZE! But what sort of moisturizer? That's the question. May I suggest you try the Za Total Hydration range's star product? The key ingredients in the range - amino mineral gel, vitamin b derivative, prism enhancer, sebum holding powder, and hyaluronic acid! I love this gel and I'd recommend it especially to young ladies! This provides moisture fix in 10 seconds flat! Late for work in the mornings? NO PROBLEM! And it's super lightweight. The texture is velvety and absorbs very easily, leaving no oily residue. Remember how I said I hated my milk moisturizer when I was younger? I didn't like the oily, sticky feeling on my face after application! This gel leaves no residue and is totally smooth after application. It doesn't leave your face looking shiny/oily either. I never liked putting heavy creams on my face before I apply makeup because I feel it cakes up my foundation. This gel won't! You practically cannot feel anything on your face except that it won't be dry anymore. Also solves problems such as conspicuous pores! The packaging is also awesomesauce. No stupid tubs and it's so flat and light you can just throw it into your bag for midday hydrating sessions! PLUS IT SMELLS SUPER NICE AND ONLY COSTS $10.90! Another product I like in the range is the Energy Mist. Especially recommended for office ladies because office aircons are always so cold and so bad for your skin!! But when you have makeup on, how do you hydrate? I never used to like mists because I always thought it would ruin my makeup. The Za girls urged me to give it a try, saying it won't, so I did. Really doesn't affect makeup lol... The nozzle is specially created to give a very very fine mist so you won't get big water droplets on your face. Skin feels so nice afterwards! You don't only have to use it after makeup. Even with a fresh face, you can spray on to moisturize if you are in a rush or if your hands are dirty! The mist refreshes tired skin, absorbs greasiness and hydrates - as a bonus it makes you smell nice too! Best used after a trip to the smoke-filled hawker centre for lunch. Comes in handy if you get occasional pimples. Fight zits! This Essence prevents recurring blemishes and sooths your skin to prevent inflammation. It dries up your zits but not your skin! Also exfoliates excess dead skin cells and moisturizes at the same time! At $9.90, worth it to give it a try if you have acne. If like me, you are at the wrong end of the 20s or your skin is naturally just very dry, a cream moisturizer would work better for you. You can try the Deep Moist Cream! 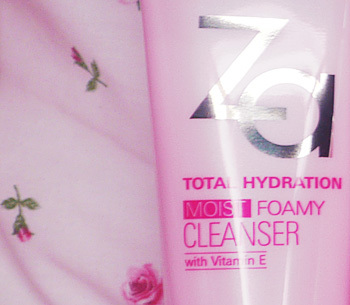 I love the Foamy Cleanser too! It leaves the skin with a very clean feeling without that squeaky dryness. If you have tried the Amino Mineral Gel and liked it, you can also invest in the Milky Moisturizer! Another two great products are the Pore Care Essence that instantly reduces the appearances of big pores and Moist Lucent Toner that replenishes and retains abundant moisture on the skin. The products are all very reasonably priced, so you can just give them a try. I'm a happy girl with my Za! If you purchase the Amino Mineral Gel you can also get a 30ml cleanser for FREE!!!!!!!! !